In March of 2018, My friend James Martin and I will lead a photographic odyssey to the one of a kind beauty of Iceland. This arctic paradise never stops amazing people with it’s sheer beauty in every direction. The world is flooded with images taken in summer, but winter reveals a different and more dramatic side. We will search for the best light and most stunning locations day and night, with the drama of winter as our backdrop, when Iceland is especially impressive. We confine ourselves to the southern part of the island to limit the amount of time spent driving and because it contains the greatest variety of photo opportunities. The surreal landscape of this winter wonderland is filled with waterfalls rimmed with ice, fjords, rugged coastlines, geysers and black sand beaches dotted with crystalline glaciers. We will shoot stunning lakes and rivers and also enormous floating icebergs that are a photographers dream to photograph. We have also planned this workshop to coincide with the new moon to let us take advantage of the night sky filled with stars and the possibility of capturing the elusive but spectacular Aurora Borealis. If you know me then you know my love of the night sky and we will be scouting for great night photography locations to light paint and capture the night sky. We are also hoping to have one or two drones to let everyone capture images of Iceland from the air, one of the best ways to capture this beautiful country. We will also photograph the beautiful Icelandic horses in fantastic settings, as these horses are about as beautiful as any on earth. We will photograph towering mountains abutting the ocean and the place where geysers got their name. We’ll also wander through the capitol, Reykjavik, and conclude with a visit to the Blue Lagoon, a mineral-rich hotspring reputed to rejuvenate the skin. I can think of no other place that packs so much is so few miles as Iceland. 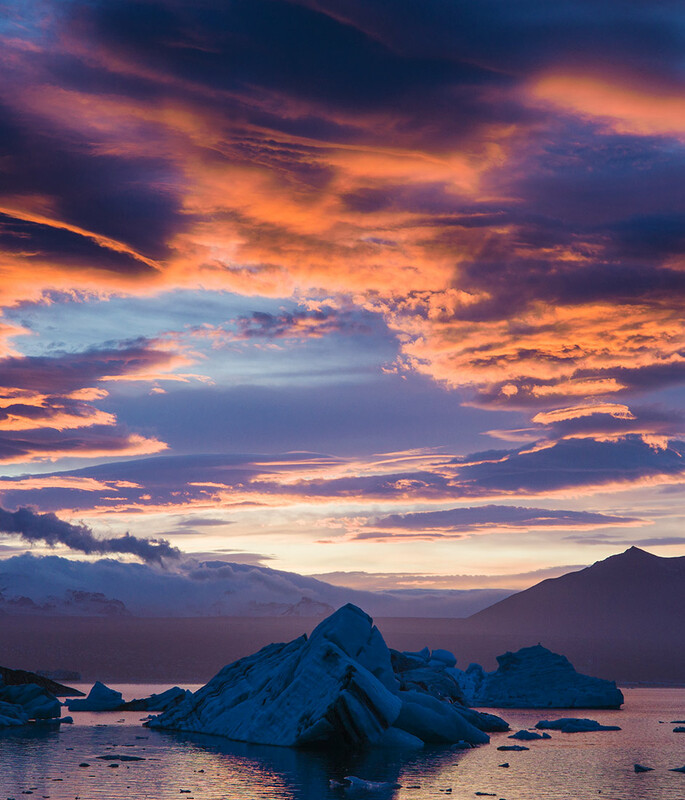 Being up early and staying out late, we will be on the prowl for some of the best photo opportunities that Iceland has to offer. My buddy James has been there six times and led many workshops, although never in winter. We both have wanted to capture the majesty of Iceland during this magical time for quite some time. 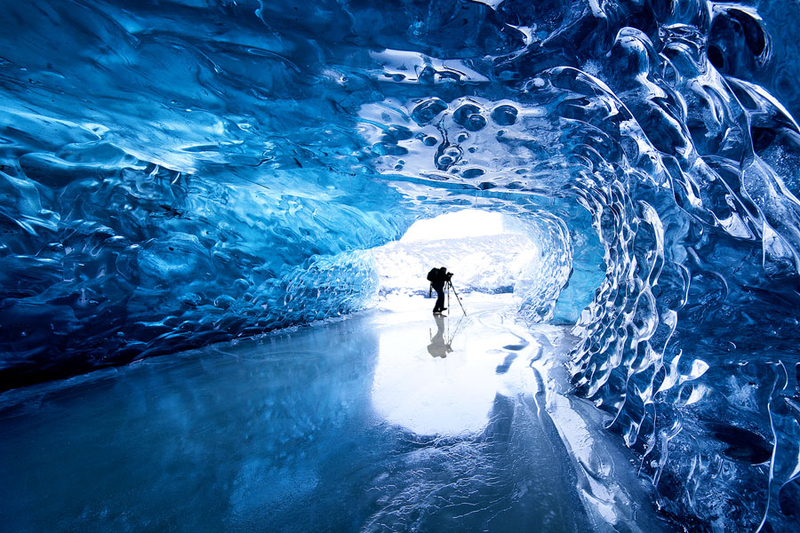 We have hired guides to take us to the sculpted ice caves, where the twisted and ethereal, blue glow of the ice makes for stunning photography. 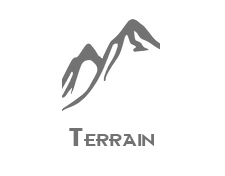 All crampons and ice gear, including special trucks to get us there will be included. We also hope to capture spectacular images of the frozen waterfalls that happen during the winter months. Most people go to Iceland during the summer months but we are planning on something different, with the beauty of winter as our backdrop. The trip will include all transportation going to many beautiful locations. All the accommodations will also be included with some beautiful hotels as we have reserved the best hotels possible in each town. We will eat together as a group throughout the workshop including some days with lunches going with us on the road. The trip to the ice caves with guides should be one of the highlights of this workshop and something that I have wanted to do for as long as I can remember. 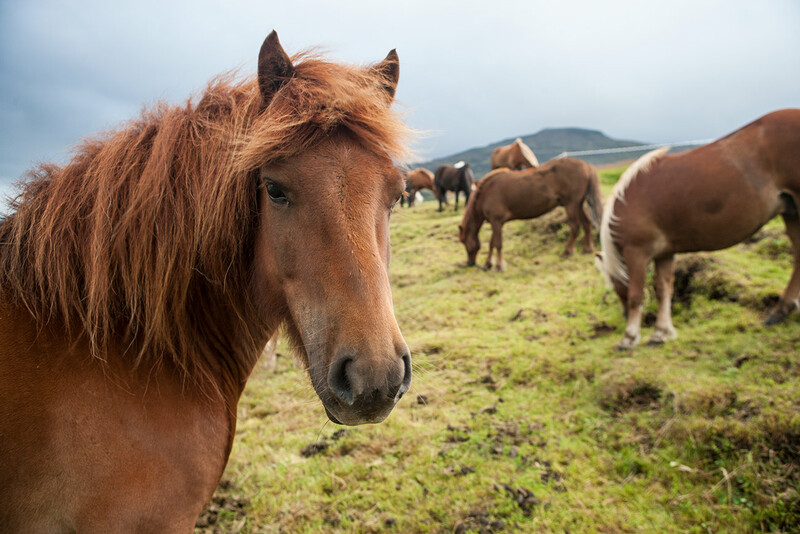 Spending a half day with the Icelandic ponies on a black beach and by the water, taking photos of these incredibly photogenic horses will also be a highlight of this workshop. 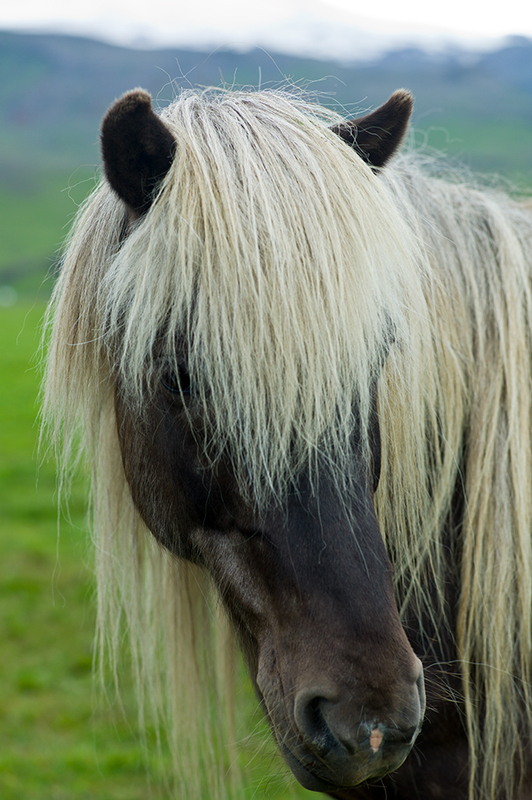 Many of you know how much I love capturing beautiful horses and these long hair horses in Iceland are one of the most beautiful breeds on the planet. We will all meet in the capital, Reykjavik on day one, and have lunch that first day together somewhere in the capital. We will go over the itinerary, show photographs of some of the places we’re going and try and do two local shoots that evening, either before or after dinner. Then it will be time to get ready to leave for our journey throughout the island the next day. We will not drive the entire way around the Ring Road on this workshop as it is incredibly time consuming. With less time on the road, we will focus on going to some of the best places for photography, day and night. The night sky is a big part of this workshop and we will be hoping for clear skies for some part of the trip to capture the breathtaking Aurora Borealis. Speaking of the weather, Iceland is cold and you will need to have warm gear and clothes for this workshop. I have a welcome letter with what you will need to bring with photos of the right gear to bring. There is also no way to guarantee we will have good weather throughout as this is Iceland and very unpredictable, especially during winter. Everyone needs to know this as weather can make or break our shots. We will hope for the best weather possible but be prepared for anything. The workshop will cost $6,475. We are limiting this workshop to a maximum of 9-10 people as I said above, as this will make for a better tour. The workshop is based on double occupancy, which is two to a room, as most workshops are. A single supplement fee to have your own room will be approx. $1,050. If we cannot find someone to share a room with you, you will have to pay the single supplement fee and have your own room. 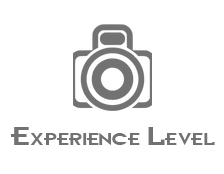 jim and I will be helping everyone individually with their photography and help them to understand the best ways to capture this beautiful country. 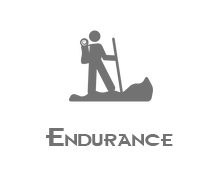 We will be with everyone all the time except the times where people can go on their own and explore in some of the towns. We will be shooting at sunrise throughout the day till sunset although this is the land of the long days. We will also be shooting a lot after dark after the sun goes down. If you know my work, you know how much I love shooting after dark as the night time brings a totally different feeling. We will be looking all over, in every place for fantastic after dark photo ops! All transportation within Iceland, lodging in the best hotels available, shooing the Icelandic horses on the beach, ice cave guide and crampons and ice climbing gear for the ice caves, shooting from at least drone in different areas and photographic instruction from two instructors throughout the workshop. 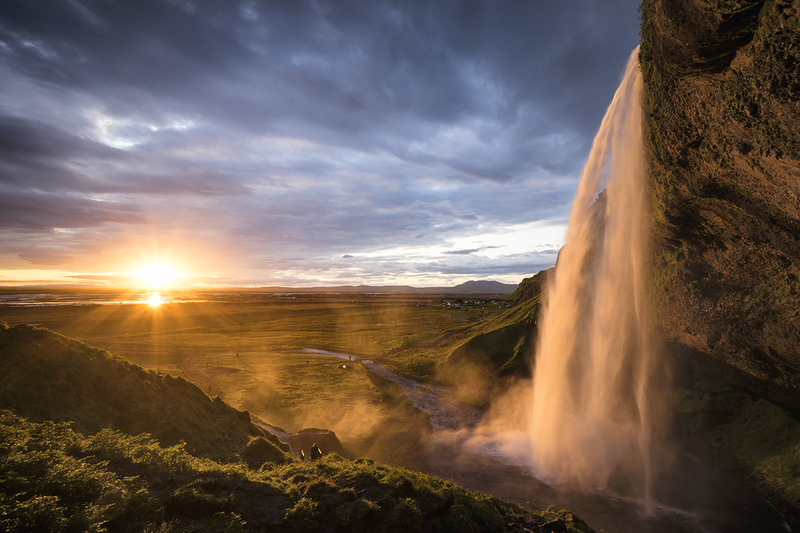 Airfare from your home to and from Iceland. Travel and trip insurance (recommended). All meals, alcoholic beverages and soft drinks, and tips for our ice guide. Anything else not specifically listed in the “what’s included” section. All of Scott Stulberg and James B. Martin Workshops Terms and Conditions apply. A deposit of $1,500 USD will guarantee your spot, and the final payment in USD will be due not later than 140 days before the workshop starts. Payment is by your personal check or you can use Pay Pal by including the Pay Pal service charge. While we don’t expect this, our workshops reserve the right to adjust the tuition of this workshop due to factors beyond our control. Your deposit is a firm commitment, and is non-refundable, as is the final payment, which is why we recommend trip insurance. We have to reserve much of the trip costs well in advance and cancellations can be detrimental to our workshop. If you need to cancel, we will try and fill your spot, but no guarantees are made on this and no refunds are promised. If we can fill your spot, you will be refunded and an administrative charge of $250 will be charged. Please do not make air travel arrangements to Iceland until checking with us first. This workshop includes a reasonable amount of walking or hiking and requires an average level of physical fitness. You can leave some camera gear in the hotel room as you might not need everything all the time but when we are in vehicles, you can bring it all with you. As I say below, it will be very cold and is a different experience than a typical workshop in warmer weather. The climate at this time in Iceland is usually hovering around 32 degrees Fahrenheit, going up and down maybe 5 to 10 degrees. It doesn’t vary much at this latitude so you have to be prepared for the cold. You will need warm clothes, boots, gloves and hats plus a bunch of hand warmers. Shooting photographs in heath warlike this can be challenging if you have never done this before but at the same time, can be incredibly rewarding. We will go over everything with you so that everyone is totally prepared but plan on being in very cold weather. As I wrote above, warmth is a priority. Dressing in layers is key and having a rain jacket and waterproof boots is also critical. You will need glove liners so that you are able to photograph once you take off your warm gloves and long underwear is a must at this time of the year. As I said, we will go over all of the clothing and essentials that are needed but it’s just like going to a ski resort and although it will be cold, the photo ops with all the snow will be amazing! The only official currency used in Iceland is Icelandic krónur (or crowns). Unless you credit card company charges you obscene amount of money for foreign charges or ATM cash withdrawals, you technically don’t need to bring any cash with you because of how widely credit cards are accepted. In fact, Icelandic people in general don’t really carry cash on a daily bases because they can and will use their cards everywhere. I would bring enough cash for emergencies, tips and just to have and you can convert it to krónur just to have with you. Iceland uses 220-240 Volts as the power source so many North American electrical devices will require converters and all will require plug adapters. The power sockets areType F: this socket also works with plug C and E Plugs and sockets have ungrounded 2 pin connections (Type C). You will need a plug adapter in order to use U.S. appliances and I would bring a few of them so you can charge a few things at once. This is the same 2 prong plugs that people use in Europe. View more information about electrical standards around the world. Medical care in Iceland is of high quality, but limited services are available outside of large urban areas, and the Icelandic medical system does not offer coverage to people who do not live in Iceland. Nonresidents are expected to pay their own medical costs, and you should be prepared to pay your bill in full before leaving the hospital or clinic. Make sure your health insurance plan provides coverage overseas. Most care providers overseas only accept cash payments. See their webpage for more information on insurance providers for overseas coverage. As I mentioned earlier, it is a good idea to be in shape as we will be walking all over the place and hiking sometimes in the countryside. For emergency medical assistance anywhere in the country, dial 112. For non-emergency medical assistance in the Reykjavik metropolitan area dial 544-4114 during business hours. Outside of normal business hours, dial 1770. If traveling with prescription medication, check with the government of Iceland to ensure the medication is legal in Iceland. Always, carry your prescription medication in original packaging with your doctor’s prescription. Vaccinations: Be up-to-date on all vaccinations recommended by the U.S. Centers for Disease Control and Prevention but nothing in particular is needed for Iceland. Day one: we meet in Iceland’s capital, Reykjavík. After lunch, we will tour the city, photographing the modernist concert hall, the dramatic Lutheran church, Hallgrímskirkja, and the city’s vibrant street life. Over dinner we’ll outline our plans for the coming days. Overnight in Reykjavik. Day 2: We drive to Geysir, a geothermal area with a reliable geyser, Strokker. En route we’ll stop at Thingviller, the site of Iceland’s democracy’s founding in 950 AD and one of the few places on the planet where an oceanic ridge formed by the expansion of tectonic plates rises above sea level. We will also photograph Gullfoss on the Hvítá river, one of the most powerful waterfalls in Iceland, where spray freezes as billowing rime ice on the frigid rock. Overnight in hotel. Day 3: If road conditions permit, we’ll photograph a lovely waterfall, Bruarfoss, as we head south to the ring road. 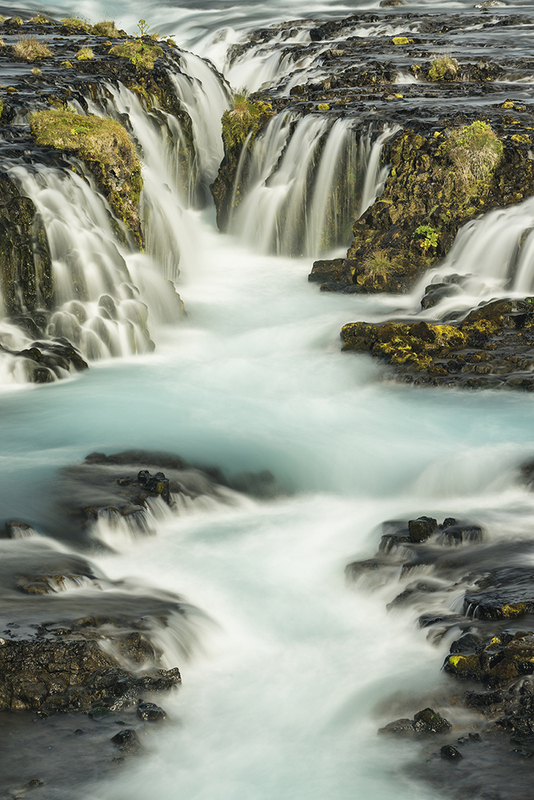 Bruarfoss is composed of many small falls arranged in an arc. Our stopping point today is Hotel Ranga, a rustic log structure boasting an excellent kitchen. We’ll stay here two nights, using it as a base to photograph Iceland’s two most famous waterfalls, Seljelandsfoss and Skogafoss, the first a lacy falls with a path behind it and to the side, the other reminiscent of Vernal Falls in Yosemite. These falls cascade off a miles- long volcanic cliff sporting smaller unnamed falls. We will venture as far east as Vik, photographing black sand beaches, sea stacks, and horses. Overnight in hotel. Day four: A continuation of Day three. Overnight in hotel. Day five: We travel across southern Iceland toward Jokulsarlon, the ice lagoon. We’ll cross braided rivers and lava fields, explore Fjaðrárgljúfur, a forbidding narrow canyon, and in clear weather we’ll see the Vatnajokul Icecap with its many glacial arms tumbling between the mountains, over 3000 square miles of ice set thousands of feet above the sea. 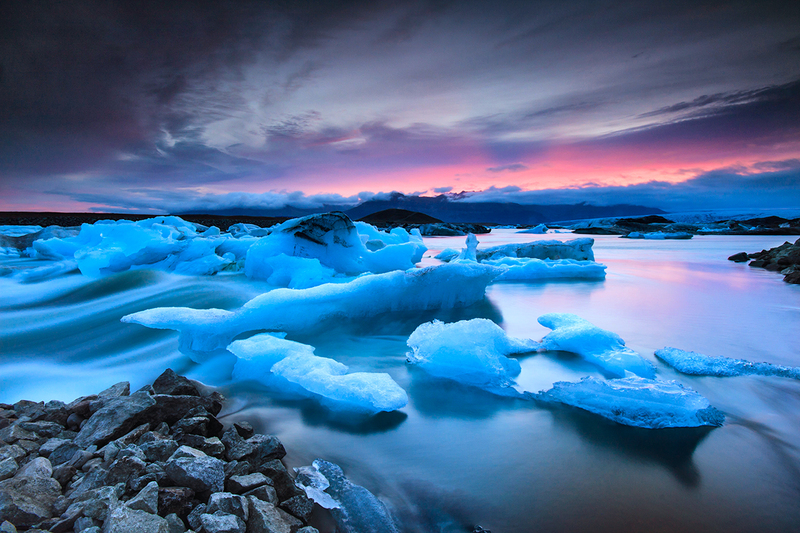 The Jokulsarlon area is usually considered the highlight of the trip. For the next two days we’ll shoot the ice, water, and mountains of Jokulsarlon from various locations and stop at other nearby lakes crowded with icebergs, rugged mountains on the edge of the sea, black sand beaches littered with stranded icebergs, and an ice cave at the toe of a glacier that streams down from the icecap. The ice caves seem to glow with blue light, the ice walls scalloped by wind. 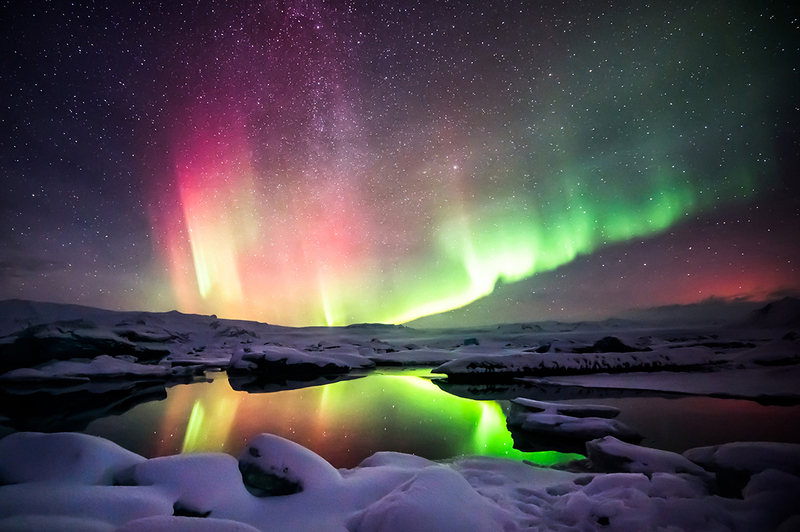 This is also a prime location for aurora photography, weather permitting. Overnight in hotel. Day Six: Jokulsarlon, Overnight in hotel. Day 8: Today we photograph horses on a beach as we retrace our route back to Reykjavik. Before enjoying a celebratory dinner, we’ll relax at the Blue Lagoon, a hot springs with mineral rich, glacial blue water. Overnight in hotel in Reykjavik. Day 9: Since we are situated in the center of Reykjavik, there will be time for most us us to shop, wander and shoot before heading to the airport. Hi Scott. Your March workshop to Iceland looks interesting, especially the opportunity to do some aerial photography. I won’t be able to make it in 2018 so I was wondering if you intend to repeat it in 2019. And since you mention the focus on night photography I wanted to know if you would adjust the dates in 2019 to match the phase of the moon during the 2018 workshop? So. I will be in India on another workshop for 2019….so not sure when I will be going back to Iceland. Sorry I didn’t see this post till now..
Too bad you can’t join us for this upcoming one in 2018. Will be some fun!! Hi Roman, so we just got back from Iceland and had a blast! but I have so many other places that I want to do workshops in..so do not think Iceland will be on the agenda anymore. Sorry you missed out on this one..The Auroras were amazing!!! !